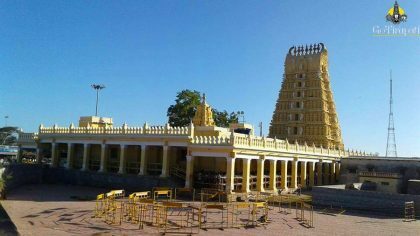 Chamundeshwari Temple in Mysore is located in Chamundi hill. This temple is one of 18 Shakti Peetas which represents Sati’s Head’s Hair. It was mentioned in the Skanda Purana about this hill shrine. It is said, Sati daughter of Daksha Prajapathi self-immolated in the fire. Angered Siva order Veera Badhra to kill Daksha. Lord Siva who collected the burnt body of Sati danced the dance of destruction. The protect the universe, Lord Vishnu sent his Disc to destroy Sati’s body. The broken pieces of Sati’s body which fell on the Earth emerged as the Sakthi Peetas. 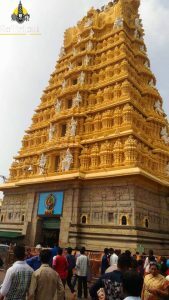 Chamundeswari Temple represents Head’s Hair. Goddess who slayed the demons Chanda and Munda and got the name Chamundeswari. She also killed the demons Sumba and Nisumba who were the vassals of Mahisasura, with their armies and finally buffalo headed demon Mahisasura. 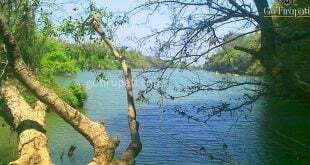 There are major contributions from Hoysala King Vishnu Vardhan in 12th Century and Vijayanagara Kings. This temple was built in Dravidian style. 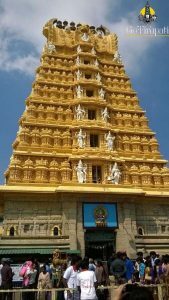 The major part of the temple was built by the Wodeyar Kings, who ruled Mysore state from 1399 A.D. 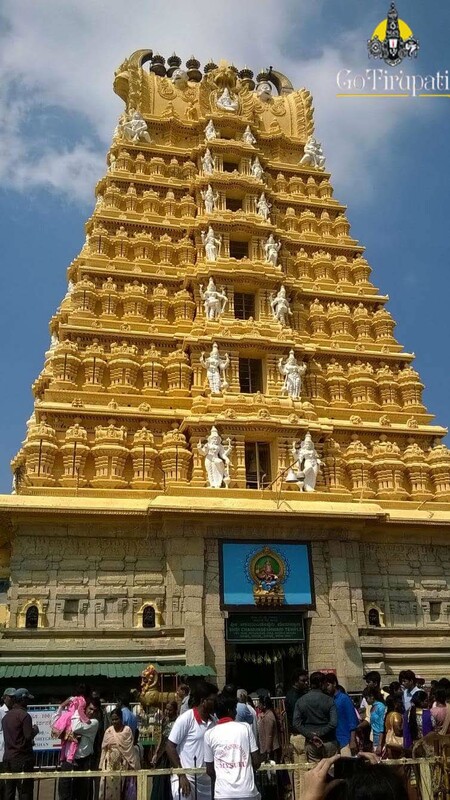 In the 1573 A.D, King Chamaraja Wodeyar IV built the Temple Tower ( Gopuram) to show his devotion, who escaped from the Thunder Lighting by an inch. 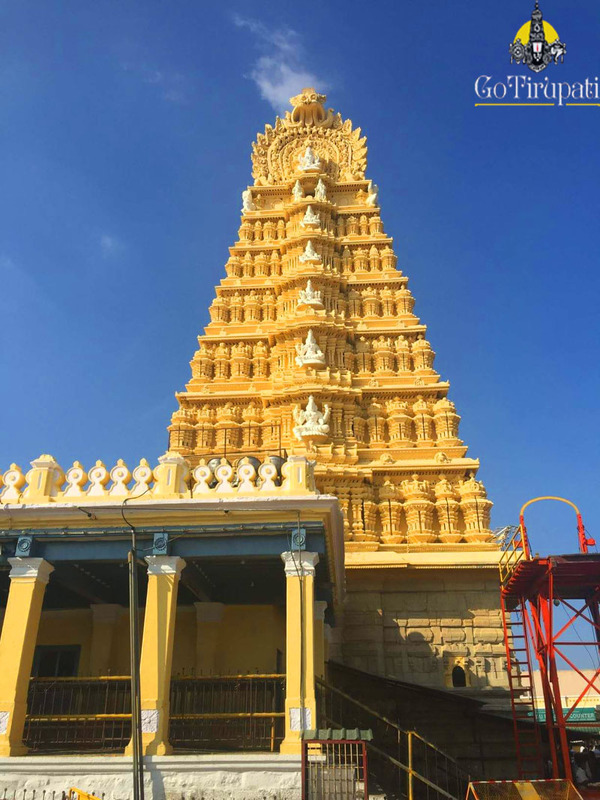 The present temple tower was rebuilt in 19th Century by the King Krishnaraja Wodeyar III. Wodeyar Kings offered gold ornaments, golden lion throne and golden armour to the goddess to express their devotion. The temple received the patronage from the Kings Haider Ali and Tippu Sultan who were the devotees of the Goddess Chamundeswari. Nandi which is of 16 ft high and 23 ft long stands right opposite to the Siva Temple. This monolithic statue was sculptured during the reign of King Dodda Devaraja, 1659 – 1672 A.D. It is also said that during this period, 1000 steps path to the Temple was built. 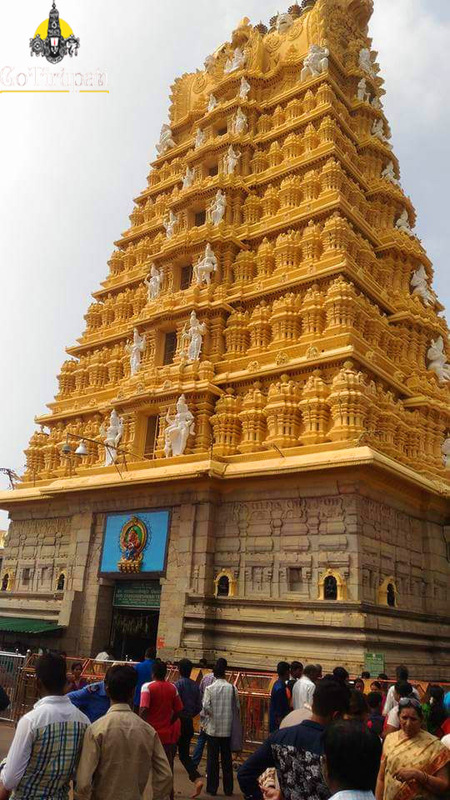 10 Day Dasara festival will be celebrated in a grand during the months of Sep/Oct. On Dasara Day, the Idol will be taken out in a procession. 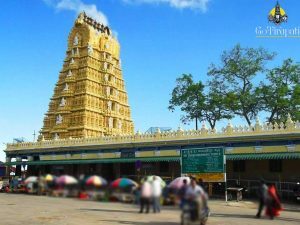 And It is the best time to visit Mysore as the palace and hill temple will be fully decorated. 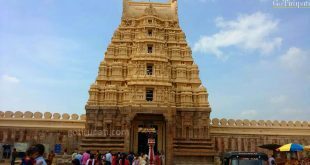 How to reach Chamundeshwari Temple? The Nearest airport is at Bengaluru which is 195 km away. 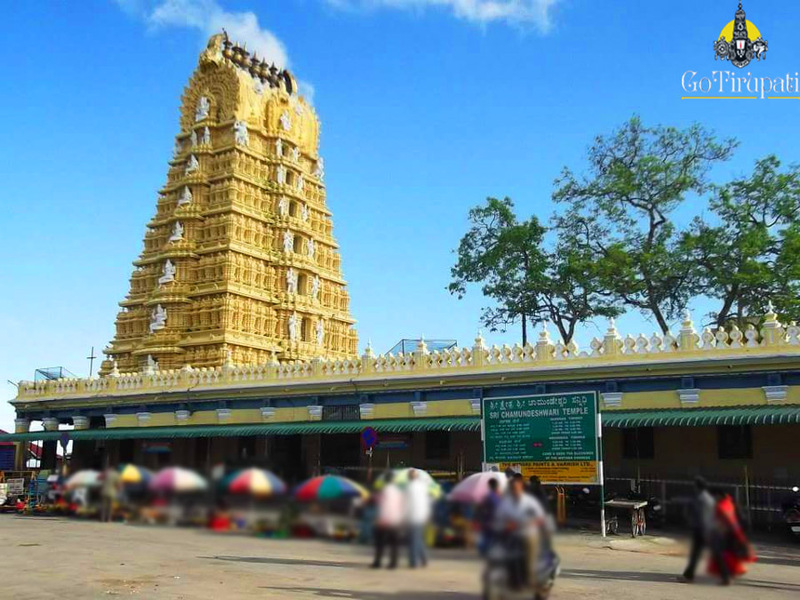 Nearest Railway station is at Mysore which is 13.9 km from Chamundi Hill. Mysore is well connected with all parts of southern India. Bengaluru Railway station is 152 km away. Daily trains are available from Bengaluru to Mysore with good frequency. Mysore is well connected with all parts of Karnataka, Major cities in Tamil Nadu, Andhra Pradesh and Kerala. 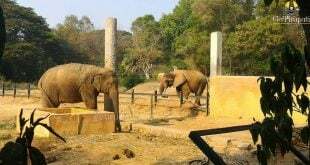 By Own vehicle, it is 3 hours drive from Bengaluru.